Thursday, March 28th at 6:30 pm. Grace United Methodist Chuch, 11485 Ridgeview Road, Olathe, Kansas. Following a brief presentation by the bishop on what transpired at General Conference, attendees will take part in small-group community building conversations that focus on our possibilities for the future of our mission in the Great Plains Conference. Saturday March 30 from 6-7pm. Sponsored by our pre-school, it is open to anyone. Cost is $10 per daughter, pay at the door. Email Lori Campbell if planning on attending at lori.campbell@lenexaumc.org. Included is all the FUN! – Dancing, snacks , coloring, and photo booth. Sunday March 31 will be UMCOR Sunday (formerly One Great Hour of Sharing). The offering taken on this Sunday supports the ongoing work of the United Methodist Committee on Relief, enabling them to respond immediately to disasters such as the one currently in the state of Nebraska. This offering enables 100% of money received for a project (including disaster relief) to go to that mission or ministry. The application for the LUMC 2019 Post-Secondary Undergraduate Scholarship is available. If you are a member of LUMC, have at least a 2.5 GPA or a GED, have been accepted to an accredited institution and will be a full-time student, you are eligible. In addition to the application, you will need to write a 300–500 word essay on your post-secondary plans and provide two letters of recommendation and an official school transcript. Contact the church office for an application. Don’t miss this opportunity! Synopsis: As Jesus continues his journey toward the cross, the disciples want to know what they will receive for having left everything to follow him. 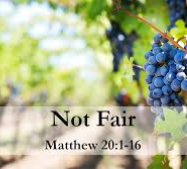 Jesus tells them a story about vineyard laborers—a story they did not much appreciate. In the upside-down Kingdom of God, God’s grace is for everyone—which may or may not sound like good news.